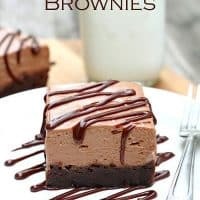 NUTELLA CHEESECAKE BROWNIES — A rich, dense brownie base is topped with a fluffy no-bake Nutella cheesecake in this decadent chocolate dessert that will make everyone think you spent hours in the kitchen. Where do I even start with these Nutella Cheesecake Brownies? Basically, you’re getting two amazing desserts in one. First there’s a dense, chewy brownie layer. And that’s topped off with a delicious no-bake Nutella cheesecake layer. Together, they equal a slice of chocolate heaven. If you’re wondering, yes, you can make the brownie layer and the Nutella cheesecake layer as two separate desserts. They are both amazing on their own! But why not have two desserts in one? The best part is, they’re really easy to make. I mean, it is hard to wait for the cheesecake layer to set so you can eat them, but other than that, this is one of those fabulous desserts that makes everyone think you spent hours in the kitchen. Just try not to eat the Nutella cheesecake layer while you wait for the brownies to cool! Meawhile, make the Nutella cheesecake layer. With an an electric mixer, beat together cream cheese, Nutella and powdered sugar until smooth. 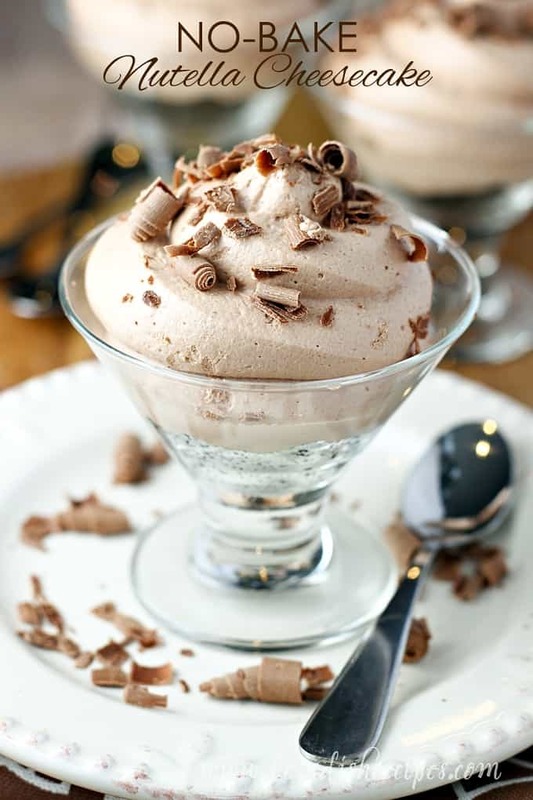 In a separate bowl, beat cream with an electric mixer until stiff peaks form. Fold the whipped cream into the Nutella mixture. Spread over the cooled brownies. 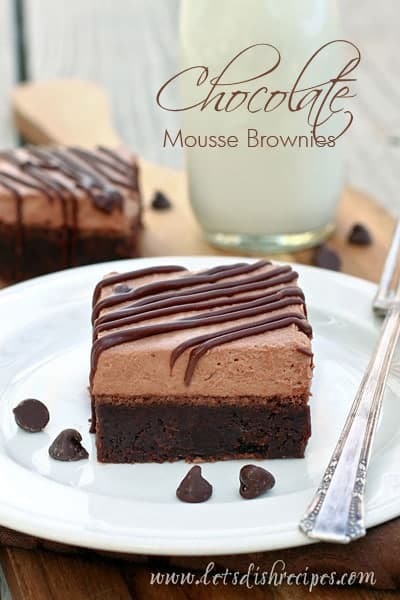 Refrigerate for at least 2 hours before serving, or until the cheesecake layer is firm. Drizzle with melted chocolate, if desired. My mom and I have agreed that nutella + cream cheese is just the best thing ever. She’s gonna be excited to make this! This recipe sounds pretty amazing!!! Nutella. Cheesecake. Brownies?! Yes, please!! This sounds sinfully delicious! 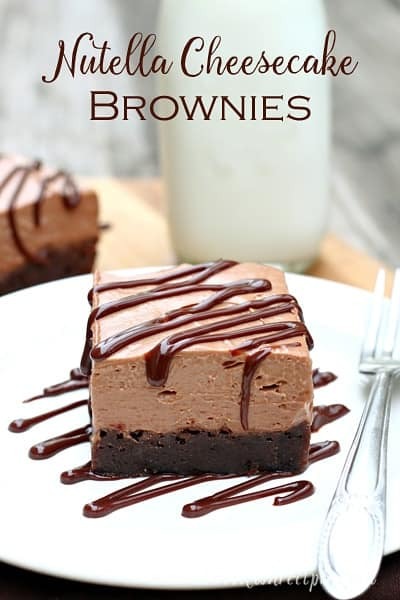 Wondering if a boxed brownie mix would work instead of doing it from scratch if one is pressed for time? Merci c’est juste dé li cieux ! Co-worker of mine had never tried Nutella. So I thought this was the perfect recipe to introduce her to the wonderful goo. YUP! The cheesecake did not set….. followed the recipe …I notice there was no binding agents…ie gelatine / condensed milk was this the problem? This cheesecake always sets up quite well for me, so I’m not sure what the problem was. If you used a light or low-fat cream cheese, it usually won’t set up nearly as well, so I always recommend full fat products in recipes like this. Whipping the cream until it’s very stiff is the only other suggestion I would make. I wanted to make this recipe today, but I was wondering what the measurements on the pan you used are? The layers don’t look too thick so I was thinking a pan larger than 8×8 but I wanted to be sure before I got started! The instructions say a 9-inch square pan, but an 8-inch square would work too if that’s what you have, it would just have slightly thicker layers. Made this twice now and it’s freaking amazing! Lasts for ages in the fridge too. My husband and I managed to make it last a whole week (I’m not sure how!) Love how easy it is too.